These Wristbands are an effective, error-free patient identification that ensures patient safety with a point-of-care process. The wrist bands have a strong adhesive backing, are waterproof and made of a tear-resistant synthetic material that allow hospitals to print anywhere. 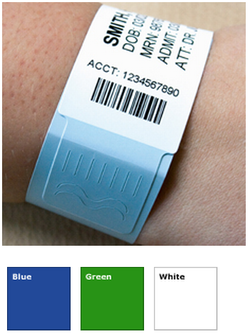 EasyID Thermal Wristbands can help hospitals prevent medical errors by printing accurate and reliable patient information. The wristbands allow for immediate availability of information that is necessary to perform medication administration, specimen collection, surgical procedures, and any other patient care activity throughout the patient's stay. EasyID is a Certified Technology Partner with Zebra Technologies and offers their "complete" line of thermal ID band products. The wristbands have an antimicrobial coating to eliminate infection-causing bacteria. Patients can wear the durable, scannable and comfortable wristbands while eliminating the risk of infections in hospitals. Check out our Direct Thermal Zebra Wristband page or our Thermal ID Wristband Product List page.